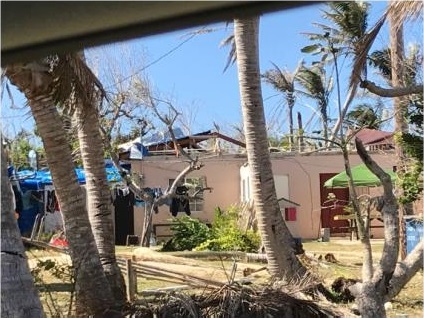 Many are aware that late last year the Island of Saipan, which is our furthest location of a United Methodist Church in our California-Pacific Conference, suffered a direct hit from Typhoon Yutu with 200 mph sustained winds for as long as eight hours. Massive destruction occurred. 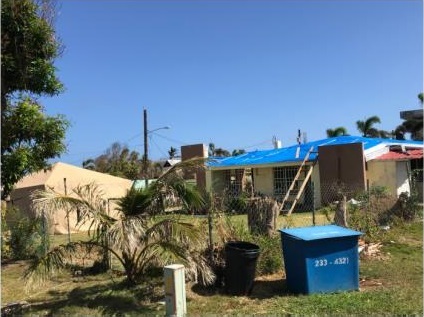 Cal-Pac Disaster Response, recognized by FEMA through our UMCOR connections, was invited to begin to organize recovery teams to work directly with FEMA in Saipan. Working with partners in Saipan can be challenging as the huge time difference makes communicating effective only in short windows when everyone is awake at the same time albeit a different day! Recovery has been slow. Although the typhoon occurred in October, 2018, there are still over 500 houses that lost not only their roofs but roof trusses were damaged and doors and windows blown out. Currently, our first team is doing assessment and has found that the promised tools were marginal, and the local hardware stores very expensive. However, ladders do not fit well in overhead bins and generators are frowned on as carry on luggage. Thanks to UMCOR generators have been shipped as far as Guam, but have been unable to ship the last 250 miles to Saipan. FEMA may be able to assist with getting the generators that last leg. Cal-Pac funds will be used to purchase needed tools for the teams to use and leave for the next likely event at secure storage at the United Methodist church. Water is a major expense as teams need lots for hydration and ice for cooling, and local water is not compatible with mainland digestive systems. Team members are being organized by lead Saipan liaison, Kathy Bryson, Pacific Northwest Disaster Coordinator (who lives in Palm Springs several months of the year and works directly with our Task Force) and Judy Lewis, Cal-Pac Disaster coordinator. Folks have applied from all over the country and were matched based on experience, skill sets, health and compatibility. ERT-trained teams are ready to go every two weeks all the way to September. Team members need to be experienced, carry UMVIM WJ insurance and are expected to work two 6-day weeks. FEMA will cover air fare expenses (about $2,300 round trip), some accommodations and a per diem for meals. There is no opportunity to extend travel time to include a vacation layover. Rev. Debbie Wise is the only UMC Pastor in Saipan and has done a fantastic job of keeping us informed about the ongoing events. She has raised awareness within the community and serves as the secretary of the local Disaster group. She has provided pictures of common scenes of jury-rigged fixes until more long-term repairs can be made. For more information, contact Judy Lewis (disasterresponse@calpacumc.org) or Kathy Bryson (pnwumcert@gmail.com).